This is Theater Week for my ballerinas. This means late nights at the theater all week rehearsing for the Nutcracker performances this weekend. Since Ballerina and Little Red are nowhere near old enough to drive, it also means that I've been at the theater every evening this week. Not a lot of cooking or baking going on here this week. 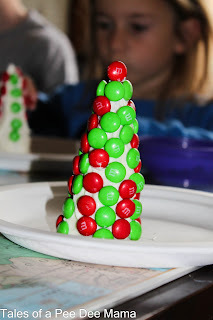 Last year during Theater Week, we made M & M Christmas Trees, and we'll be making them again today. You can see the post from last year here. Simply spread frosting on cones and cover with M&M's. Easy!